Tyler was sure of him: he was an early bird and waking up at 5:30 was not a problem. He was right! He convinced his girlfriend to wake up too and enjoy the magnificent view on the Eiffel Tower before sunrise. No doubt about it, sunrise is the best time for a proposal in Paris! Misael and Yurico had arrived by train from London after a long flight from Houston, Texas. Our meeting place was just down the Eiffel Tower but it was much too crowded at 1PM to organize something intimate there. 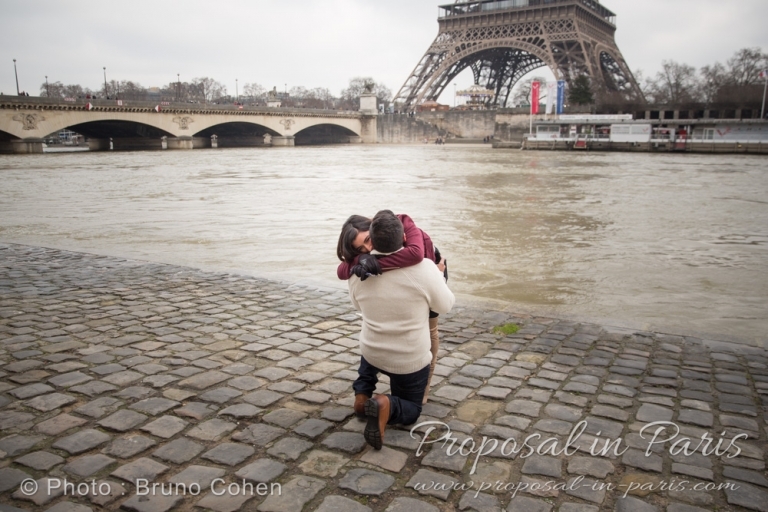 During our preparation with Misael, I suggested to convince his girlfriend to walk along the river Seine….